2nd declination with after 7 to 10 years spent in casks, maturation in American white wine! same feeling as the red wine finish with this time a sensation focused on the finishes in yellow wine! so a little less sweetness, a little more cooked fruit, a little mold too! simple, short to medium, but monolithic !! a dram that brings another, ideal as a good starter! One of those whiskers that, once opened, is gaining in quality. I usually can not win wine finishes that much. After the Green Spot Chateau Leoville Barton, there was great hope that the subsequent bottling might be the re-launch of a Blue Spot or Red Spot. But no, still n wine finish. But uh, luck, the finish here has not messed up, but the nice flavors of the standard Green Spot "a little underfed". Nice addition to the Green Spot range. Unfortunately not yet available in Germany. Sweet-spicy with a (in a positive sense) interesting combination of ginger cookies, milk chocolate, vanilla and ripe red grapes. Oak wants to get involved, but ultimately does not prevail. On the other hand, after some time even more fruits come to the fore: blackberries, raspberries and cherries. The spice remains discreetly in the background or is put there by the fruit flavors and superimposed. Cinnamon is to be guessed, perhaps also still grated cloves. Dry already in the start with grape juice, oak chips, freshly ground coffee beans and bitter honey. Slightly cooling / mentholig. This grape juice note is not known from the standard Green Spot, so it could come from the wine barrel. Again, the berry mix from the nose. On the tongue, however, spicy with a nice interplay of fruit and spice. Nougat chocolate and ice coffee. Medium to long, stays cool, but it is always spicy and gets a pleasant impact of fine herbs. Nougat chocolate en masse. Also has a bit of Tiramisu in liquid. Pleasant summer whiskey that plays beautifully with the pot-still seasoning in combination with sweet fruits. In the PLV something very decent. Fruity, sweet raspberries, grapes, subtly vanilla behind. The pot-still seasoning remains without disturbing. medium-long, seasoning is preserved, floral notes, light honey sweetness to some tart cocoa. Oily texture, slightly thick. At first contact it's fresh and simple. We go back. Spicy wood, honey, whose sweet aromas are a little stifled by a certain acidity. We find in the background the fruits of the nose. The typical Irish roundness appears after a few seconds but fades quickly. Medium, on slightly bitter tannins and some dry fruits. 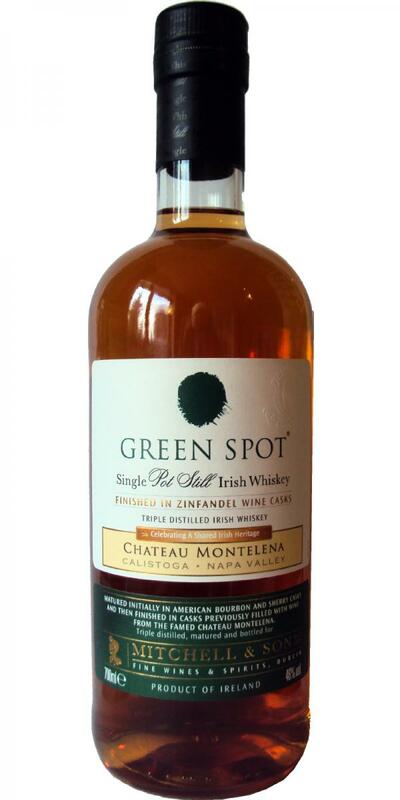 By default, Green Spot consists of 7 - 10 year old single pot still whiskeys made from sherry and bourbon barrels. Here is a 12-month ripening in French Oak Zinfandel Wine Casks.